The Golden Compass is a 2007 fantasy adventure film based on Northern Lights, the first novel in Philip Pullman's trilogy His Dark Materials. Written and directed by Chris Weitz, it stars Nicole Kidman, Dakota Blue Richards, Daniel Craig, Sam Elliott, Eva Green, and Ian McKellen. The project was announced in February 2002, but difficulties over the script and the selection of a director caused significant delays. At US$180 million, it was one of New Line Cinema's most expensive projects ever, and its disappointing results in the US contributed to New Line's February 2008 restructuring. Before its release, the film received criticism from secularist organisations and fans of the His Dark Materials trilogy for the dilution of elements of the story which were critical of religion, as well as from some religious organisations for the source material's anti-religious themes. The studio ordered significant changes late in post-production, which Weitz later called a "terrible" experience. Although the film's visual effects (which Weitz has called the film's "most successful element") won both a BAFTA and an Academy Award, critical reception was mixed and revenue lower than anticipated. The story takes place in an alternate world dominated by a powerful church called the Magisterium, and where part of the spirit resides outside a person as an animal companion called a dæmon. At present, poor, orphan and Gyptian children are disappearing at the hands of a group that the children call the Gobblers. Lyra Belacqua (Dakota Blue Richards) is an orphan raised at Jordan College in Oxford, while her uncle, esteemed explorer and scholar Lord Asriel (Daniel Craig), is busy seeking the elusive Dust, a cosmic particle of which the Magisterium has forbidden even the mention. When Asriel returns from his latest expedition, Lyra and her dæmon Pantalaimon (Freddie Highmore) witness a Magisterium agent poison his wine. Lyra warns her uncle, saving his life; then she watches Asriel give a presentation regarding his findings on the North Pole, where he was able to prove the Dust's existence. The college gives Asriel a grant to fund another expedition that could lead to the discovery of the infinite worlds linked by Dust, which would severely undermine the Magisterium's hold on the world. At dinner, Lyra meets Mrs. Coulter (Nicole Kidman), a wealthy, powerful woman who is presented as "a friend of the college". Mrs. Coulter insists on taking Lyra on a trip north as her assistant. Before Lyra leaves, the Master of the college entrusts her with the only remaining alethiometer, a compass-like artifact that reveals the truth. The Magisterium has seized or destroyed all the others. He instructs her to keep it secret, especially from Mrs. Coulter. Mrs. Coulter takes Lyra into her home, in a big city that resembles a retrofuturistic London, and starts taking her to socialite dinners and parties. In her bedroom, Lyra gazes upon the alethiometer and notices that it continuously points to a lady, a lightning bolt and a baby. She does not know what to make of her observation, however, and says nothing of it to Mrs. Coulter. Despite initially projecting the image of a free-spirited woman, she reveals herself to be extremely respectful of the Magisterium and its function. One night, Lyra casually mentions Dust; this puts Mrs. Coulter on edge as she warns Lyra never to mention it again, and also insists that she stop carrying around the bag secretly containing the aleithiometer. Mrs. Coulter's dæmon (a golden monkey) attacks Pantalaimon, causing Lyra to give in. Lyra and Pantalaimon discover that Mrs. Coulter is head of the General Oblation Board, also known as the "Gobblers", who have been kidnapping local children. Lyra also learns that her best friend Roger and her Gyptian friend Billy have been both taken by the Gobblers. Lyra and Pantalaimon walk in on Mrs. Coulter's dæmon attempting to steal the alethiometer and they escape into the streets. The Gobblers pursue her, but she is saved by Billy's mother, who takes her to the ship of the King of the Gyptians, heading north to rescue all the captured children. Lyra shows the alethiometer to a wise Gyptian elder, Farder Coram (Tom Courtenay), and it is revealed that she is able to decipher the device's answers. After consulting with the Magisterium agent, Mrs. Coulter sends two mechanical spy-flies after Lyra. One is batted away but the other is caught and sealed in a can by Farder Coram, who explains that the spy-fly has a sting with a sleeping poison. Meanwhile, Lord Asriel has reached Svalbard, the kingdom of the Ice Bears, but he is captured by Samoyed tribesmen hired by Mrs. Coulter. One night, Lyra is visited on the ship by a witch queen, Serafina Pekkala (Eva Green). She tells Lyra that the missing children are in an experimental station called Bolvangar. At a northern port, Lyra is befriended by a Texan aeronaut named Lee Scoresby (Sam Elliott), who advises her to hire himself and his friend Iorek Byrnison (Ian McKellen), an armoured bear that Lee has come to rescue. Once a prince of his people, but now exiled in shame, the giant polar bear has been tricked out of his armour by the local townspeople. Using the alethiometer, Lyra tells Iorek where to find his armour. After recovering his armour, Iorek joins the Gyptian trek northward, along with Lee. While the group is camped for the night, Lyra rides on Iorek's back to an abandoned building the alethiometer pointed her toward. There, Lyra finds an escaped, cowering Billy separated from his dæmon named Ratter and realises that is what the Gobblers are doing to the kidnapped children, something they call "intercision". Lyra reunites Billy with his mother just as the group is attacked by Samoyeds, who capture Lyra. Iorek and Lee follow her in Lee's airship. Taken to the bear king Ragnar Sturlusson (Ian McShane), Lyra tricks him into fighting Iorek one on one. At first, Ragnar, who had already beaten Iorek while usurping his throne, seems to have the upper hand in the fight, but Iorek eventually manages to kill his rival, becoming the new and rightful king. Iorek carries Lyra to a thin ice bridge near Bolvangar, but only Lyra is able to cross over before the bridge breaks. Upon reaching the station, Lyra is welcomed in and taken to eat dinner with the children, where she is reunited with Roger. While sneaking around, Lyra hears Mrs. Coulter tell the station scientists that Asriel has escaped capture and set up a laboratory, but Magisterium soldiers are on their way to arrest and execute him for heresy. She also hears the scientists talk about their experiments to sever the bond between a child and his or her dæmon. Caught spying, Lyra and Pantalaimon are thrown in the intercision chamber, and end up unconscious. On seeing Lyra in the chamber, Mrs. Coulter rescues her and takes her to her quarters. When Lyra wakes up, Mrs. Coulter explains to Lyra how, in her and the Magisterium's view, the intercision is needed to save the children from the corrupting influence of the Dust. She also reveals she is Lyra's mother, but was forced to give her away because at the time of her birth she was not married. Lyra correctly guesses that Asriel is her father. When Mrs. Coulter asks for the alethiometer, Lyra gives her the can containing the spy-fly instead. The fly stings Mrs. Coulter, knocking her and her dæmon out. Lyra runs to the room with the intercision machine and manages to destroy it, setting off a series of explosions that tear the facility apart. Outside, the fleeing children are attacked by Tartar mercenaries and their wolf dæmons. The battle is joined by Iorek, Lee Scoresby, the Gyptians, and a band of flying witches led by Serafina Pekkala. The Tartars are defeated and the children are rescued. Rather than returning south, Lyra, Roger, Iorek, Lee and Serafina fly further north in search of Asriel. Confirming Serafina's prophecy of an upcoming war with Lyra at the centre, Lyra is determined to fight the Magisterium and stop their plans, which include taking over all the other worlds in the universe. Nicole Kidman at the film's premiere. Dakota Blue Richards as Lyra Belacqua, who embarks on a voyage to battle the forces of evil and rescue her best friend. New Line Cinema announced 11-year-old Richards' casting in June 2006. It was her first acting role. Nicole Kidman as Mrs. Coulter, an influential woman who takes an interest in Lyra (and later admits that she is Lyra's mother). Kidman was author Philip Pullman's preferred choice for the role ten years before production of the film, and despite initially rejecting the offer to star as she did not want to play a villain, she signed on after receiving a personal letter from Pullman. Daniel Craig as Lord Asriel, Lyra's strict and mysterious adventurer uncle (later revealed to be her father). In July 2006, it was reported that Paul Bettany was in talks to play the role. Sam Elliott as Lee Scoresby, a Texan aeronaut who comes to Lyra's aid. Pullman has singled out Elliott's performance as one the film got "just right". Eva Green as Serafina Pekkala, a witch queen. Jim Carter as John Faa, the king of the Gyptians. Clare Higgins as Ma Costa, member of a Gyptian family that aids Lyra. Ben Walker as Roger Parslow, Lyra's best friend, who is kidnapped and taken north. Charlie Rowe as Billy Costa, son of Ma Costa, and Lyra's friend. Christopher Lee as the Magisterium's first high councilor. Lee's casting was also at New Line's behest, rather than that of Chris Weitz. Tom Courtenay as Farder Coram, Gyptian second-in-command and advisor to John Faa. Derek Jacobi as the Magisterial emissary. Simon McBurney as Fra Pavel, a Magisterial agent. Jack Shepherd as master of Jordan College. Edward de Souza as the Magisterium's second high councilor. Ian McKellen as Iorek Byrnison, a panserbjørn (armored bear) who becomes Lyra's friend and comrade. Nonso Anozie had recorded lines for the part of Iorek Byrnison, but was replaced by McKellen at a late stage as New Line wanted a bigger name in the role. New Line president of production Toby Emmerich claimed that he "never thought Anozie sounded like Iorek" and while he initially trusted director Weitz's casting decision, he "never stopped thinking that this guy didn't sound right." The recasting was against Weitz's wishes, though he later said "if you're going to have anyone recast in your movie, you're happy it's Ian McKellen." Freddie Highmore as Pantalaimon, Lyra's dæmon. Pan was originally to be voiced by an older actor, but they called in Highmore instead, as it would be more of an intimate relationship if Pan and Lyra were the same age, and also would underscore the contrast between Lyra's relationship with him versus her relationships with older male characters such as Lord Asriel, Lee Scoresby and Iorek. Ian McShane as Ragnar Sturlusson, king of the panserbjørne. Ragnar's name in the book was Iofur Raknison, but the name was changed to prevent confusion between him and Iorek. However, in the German-language version of the film, the dialogue retains the name "Iofur Raknison", whilst the subtitles reflect the change. Kathy Bates as Hester, Lee Scoresby's jackrabbit dæmon. Kristin Scott Thomas as Stelmaria, Lord Asriel's dæmon. "Peter's operation was so impressive that, well, I realised the distance between me and Peter Jackson… At that moment, I realised the sheer scope of the endeavor. And I thought, 'You know what? I can't do this'." On February 11, 2002, following the success of New Line's The Lord of the Rings: The Fellowship of the Ring, the studio bought the rights to Philip Pullman's His Dark Materials trilogy. In July 2003 Tom Stoppard was commissioned to write the screenplay. Directors Brett Ratner and Sam Mendes expressed interest in the film, but a year later, Chris Weitz was hired to direct after approaching the studio with an unsolicited 40-page treatment. The studio rejected the script, asking Weitz to start from scratch. Since Weitz was a fan of Stoppard, he decided not to read the adaptation in case he "subconsciously poached things from him." After delivering his script, Weitz cited Barry Lyndon and Star Wars as stylistic influences on the film. In 2004, Weitz was invited by The Lord of the Rings director Peter Jackson onto the set of King Kong in order to gather information on directing a blockbuster film, and to receive advice on dealing with New Line Cinema, for whom Jackson had worked on Lord of the Rings. After a subsequent interview in which Weitz said the novel's attacks on organised religion would have to be softened, he was criticised by some fans, and on December 15, 2004, Weitz announced his resignation as director of the trilogy, citing the enormous technical challenges of the epic. He later indicated that he had envisioned the possibility of being denounced by both the book's fans and its detractors, as well as a studio hoping for another Lord of the Rings. On August 9, 2005, it was announced that British director Anand Tucker would take over from Weitz. Tucker felt the film would thematically be about Lyra "looking for a family", and Pullman agreed: "He has plenty of very good ideas, and he isn't daunted by the technical challenges. But the best thing from the point of view of all who care about the story is his awareness that it isn't about computer graphics; it isn't about fantastic adventures in amazing-looking worlds; it's about Lyra." Tucker resigned on May 8, 2006, citing creative disagreements with New Line, and Weitz returned to direct. Weitz said "I'm both the first and third director on the film … but I did a lot of growing in the interim." According to producer Deborah Forte, Tucker wanted to make a smaller, less exciting film than New Line wanted. New Line production president Toby Emmerich said of Weitz's return: "I think Chris realised that if he didn't come back in and step up, maybe the movie wasn't going to get made … We really didn't have a Plan B at that point." Weitz was attracted back to the project after receiving a letter from Pullman asking him to reconsider. Since his departure, blueprints, production design and visual effects strategies had been put into position, and while Weitz admitted that his fears did not vanish, the project suddenly seemed feasible for the director. Filming began at Shepperton Studios on September 4, 2006, with additional sequences shot in Switzerland and Norway. Filming also took place at the Old Royal Naval College at Greenwich, Chiswick House in London, and in Radcliffe Square, Christ Church, Oxford, Exeter College, Oxford, The Queen's College, Oxford, The Historic Dockyard Chatham and Hedsor House in Buckinghamshire. The whole project is about translation—translation from something you would understand into something that is in a different vernacular. So, it's a new signature, looking into another world that seems familiar but is still unique. There's a term I use—called 'cludging'—it's taking one element and combining it with another element to make something new. It's a hybrid or amalgamation, and that's what this movie is about from a design perspective. It's about amalgamating ideas and concepts and theoretical and physical environments. Rhythm and Hues Studios created the main dæmons and Framestore CFC created all the bears. British company Cinesite created the secondary dæmons. Numerous scenes from the novel did not feature in the film or were markedly changed. On December 7, 2007, New York magazine reviewed draft scripts from both Stoppard and Weitz; both were significantly longer than the final version, and Weitz's draft (which, unlike Stoppard's, did not feature significant additions to the source material) was pronounced the best of the three. The magazine concluded that instead of a "likely three hours of running time" that included such scenes as Mrs. Coulter's London party and Lyra's meeting with a witch representative, the studio had opted for a "failed" length of under two hours in order to maximise revenue. On October 9, 2007, Weitz revealed that the final three chapters from Northern Lights had been moved to the film's potential sequel, The Subtle Knife, in order to provide "the most promising conclusion to the first film and the best possible beginning to the second," though he also said less than a month later that there had been "tremendous marketing pressure" to create "an upbeat ending." (The San Francisco Chronicle found this "truncated" ending abrupt.) Author Pullman publicly supported these changes, saying that "every film has to make changes to the story that the original book tells—not to change the outcome, but to make it fit the dimensions and the medium of film". In addition to removing the novel's unsettling ending, the film reverses the order in which Lyra travels to Bolvangar, the Gobbler's outpost, and then Svalbard, the armoured bears' kingdom. (Neither deviation from the book features in Scholastic Publishing's The Golden Compass: The Story of the Movie novelisation.) In July 2009, Weitz told a Comic Con audience that the film had been "recut by [New Line], and my experience with it ended being quite a terrible one"; he also told Time.com that he had felt that by "being faithful to the book I was working at odds with the studio". In 2011, Pullman told an audience at the British Humanist Association annual conference that he was also disappointed by this decision, and hoped that a director's cut of the film would be released some day including the footage cut by New Line. In the book the Jordan College Master reluctantly poisons Lord Asriel's wine; in the film a visiting Magisterium official undertakes (more willingly) this action. The alethiometer is mentioned multiple times throughout the film as a "golden compass". In the film, Billy Costa replaces Tony Makarios as the victim of intercision, and Tony is left out. Billy has the daemon Ratter, which is Tony's in the book. Billy features in the first scene of the film, whereas, in the book, he is first seen at Bolvangar, and is saved before ever having to go through intercision. Tasha Robinson of The A.V. Club argued that through the use of a spoken introduction and other exposition-filled dialogue, the film fails by "baldly revealing up front everything that the novel is trying to get you to wonder about and to explore slowly". Youyoung Lee wrote in a December 2007 Entertainment Weekly that the film "leaves out the gore", such as the book's ritualistic heart-eating that concludes the bear fight, "to create family-friendlier fare". Lee also said that the film "downplays the Magisterium's religious nature", but Robinson argued that the depiction of the church in the film is as "a hierarchical organisation of formally robed, iconography-heavy priests who dictate and define morality for their followers, are based out of cathedrals, and decry teachings counter to theirs as 'heresy.' ... doing ugly things to children under cover of secrecy". Robinson then asks, "Who are most people going to think of besides the Catholic Church?" The film gives more prominence to scenes showing the Magisterium officials' perspective than the novel. The novel rarely mentions explicitly the Magisterium's intentions, relying on the gossip of others, and the comments of Mrs. Coulter. Although the character of Mrs. Coulter has black hair in the novel, Pullman responded to the blonde Kidman's portrayal by saying "I was clearly wrong. You sometimes are wrong about your characters. She's blonde. She has to be." Several key themes of the novels, such as the rejection of religion and the abuse of power in a fictionalised version of the Church, were diluted in the adaptation. Director Weitz said that "in the books the Magisterium is a version of the Catholic Church gone wildly astray from its roots", but that the organisation portrayed in his film would not directly match that of Pullman's books. Instead, the Magisterium represents all dogmatic organisations. Weitz said New Line Cinema had feared the story's anti-religious themes would make the film financially unviable in the US, and so religion and God ("the Authority" in the books) would not be referenced directly. Attempting to reassure fans of the novels, Weitz said that religion would instead appear in euphemistic terms, yet the decision was criticised by some fans, anti-censorship groups, and the National Secular Society (of which Pullman is an honorary associate), which said "they are taking the heart out of it, losing the point of it, castrating it ..." and "this is part of a long-term problem over freedom of speech." The Atlantic Monthly said also "With $180 million at stake, the studio opted to kidnap the book's body and leave behind its soul." The changes from the novel have been present since Tom Stoppard's rejected version of the script, and Pullman expected the film to be "faithful," although he also said, "They do know where to put the theology and that's off the film." A Christianity Today review of the film noted that "'Magisterium' does refer, in the real world, to the teaching authority of the Roman Catholic Church, and the film [is] peppered with religiously significant words like 'oblation' and 'heresy'", adding that when one character smashes through the wall of a Magisterium building, the damaged exterior is "decorated with [Christian] Byzantine icons." On October 7, 2007, the Catholic League called for a boycott of the film. League president William A. Donohue said he would not ordinarily object to the film, but that while the religious elements are diluted from the source material, the film will encourage children to read the novels, which he says denigrate Christianity and promote atheism for children. He cited Pullman telling The Washington Post in 2001 that he is trying to undermine the basis of Christian belief. The league hoped that "the film [would fail] to meet box office expectations and that [Pullman's] books attract few buyers", declaring the boycott campaign a success after a North American opening weekend which was lower than anticipated. One week after the film's release, Roger Ebert said of the campaign, "any bad buzz on a family film can be mortal, and that seems to have been the case this time." Albert Mohler, the president of the Southern Baptist Theological Seminary, agreed that the broad appeal of the film was a dangerous lure to the novels, which he criticised for carrying a clear agenda to expose what [Pullman] believes is the "tyranny of the Christian faith" and for "[providing] a liberating mythology for a new secular age." Denny Wayman of the Free Methodist Church made the assertion that The Golden Compass is a "film trying to preach an atheistic message". Other evangelical groups, such as the Christian Film and Television Commission, adopted a "wait-and-see" approach to the film before deciding upon any action, as did the Roman Catholic Church in England and Wales. Some religious scholars have challenged the view that the story carries atheistic themes, while in November 2007, a review of the film by the director and staff reviewer of the United States Conference of Catholic Bishops' (USCCB) Office for Film and Broadcasting appeared on the website of the Catholic News Service and in Catholic newspapers across the country. The review suggested that instead of a boycott, it may be appropriate for Catholic parents to "talk through any thorny philosophical issues" with their children. However, on December 10, 2007 the review was removed from the website at the USCCB's request. On December 19, 2007, the Vatican newspaper, L'Osservatore Romano, published an editorial in which it denounced the film as godless. Pullman said of Donohue's call for a boycott, "Why don't we trust readers? Why don't we trust filmgoers? Oh, it causes me to shake my head with sorrow that such nitwits could be loose in the world." In a discussion with Donohue on CBS's Early Show, Ellen Johnson, president of American Atheists, said that rather than promote atheism, the film would encourage children to question authority, saying that would not be a bad thing for children to learn. Director Weitz says that he believes His Dark Materials is "not an atheistic work, but a highly spiritual and reverent piece of writing," and Nicole Kidman defended her decision to star in the film, saying that "I wouldn't be able to do this film if I thought it were at all anti-Catholic." Some commentators indicated that they believed both sides' criticism would prove ultimately impotent and that the negative publicity would prove a boon for the film's box office. Nonetheless, the film trilogy has not been continued, prompting actor Sam Elliott to blame censorship and the Catholic Church. The film premiered in London on November 27, 2007, and was released on December 5, 2007, in British cinemas by Entertainment Film Distributors and released on December 7, 2007, in American cinemas by New Line Cinema. The film was released on DVD and Blu-ray Disc formats in the United Kingdom on April 28, 2008, and the United States on April 29, 2008. The movie is closed-captioned by the National Captioning Institute on its first Home Video release. The extra material on the single-disc DVD consists of previews of upcoming New Line Cinema films. The two-disc edition includes a commentary from writer/director Chris Weitz, eleven "making-of" featurettes, a photo gallery, and theatrical and teaser trailers. The Blu-ray Disc features the same extras from the two-disc DVD edition. Exclusive to Blu-ray Disc is visual commentary picture-in-picture feature which enables viewers to access behind-the-scene features while watching the movie. Shortly before the film's release, Weitz suggested that an extended cut of the film could be released on DVD, saying "I'd really love to do a fuller cut of the film"; he further speculated that such a version "could probably end up at two and a half hours." This proposed cut would presumably not include the original ending: MTV reported in December 2007 that Weitz hoped to include that material at the beginning of a possible The Subtle Knife adaptation, and that a Compass Director's Cut might feature "a moment" of it as a "teaser". Cast members Craig and Green have echoed this hope for such a DVD cut; so far, however, no official announcement has been made. The North American opening weekend return was "a little disappointing" for New Line Cinema, earning US$25.8 million with total domestic box office of $70 million compared to an estimated $180 million production budget. Despite this, the film's fortunes rebounded as its performance outside the United States was described as "stellar" by Variety, and as "astonishing" by New Line. In the United Kingdom, the film grossed $53,198,635 and became the second-highest-grossing non-sequel of 2007 there (behind The Simpsons Movie). In Japan, the film was officially released in March 2008 on 700 screens, ultimately grossing $33,501,399; but previews of the film between February 23–24, 2008, earned $2.5 million. By July 6, 2008, it had earned $302,127,136 internationally, totaling $372,234,864 worldwide. Overseas rights to the film were sold to fund the $180 million production budget for the film, so most of these profits did not go to New Line. This has been cited as a possible "last straw" in Time Warner's decision to merge New Line Cinema into Warner Bros. Pictures. Reviews of The Golden Compass were mixed. Review aggregator Rotten Tomatoes gave the film a 42% rating, based on 193 reviews. The critical consensus reads: "Without the bite or the controversy of the source material, The Golden Compass is reduced to impressive visuals overcompensating for lax storytelling." At Metacritic, which assigns a weighted average rating out of 100 to reviews from mainstream critics, the film has received an average score of 51, based on 33 reviews. Manohla Dargis of The New York Times said that the film "crams so many events, characters, ... twists and turns, sumptuously appointed rooms and ethereally strange vistas ... that [it] risks losing you in the whirl" and that while The Golden Compass is "an honorable work," it is "hampered by its fealty to the book and its madly rushed pace." James Berardinelli of ReelReviews gave the film two and a half stars out of four, calling it "adequate, but not inspired" and criticising the first hour for its rushed pace and sketchily-developed characters. James Christopher of The Times was disappointed, praising the "marvellous" special effects and casting, but saying that the "books weave a magic the film simply cannot match" and citing a "lack of genuine drama." Time rated it a "B" and called it a "good, if familiar fantasy," saying "The find is Dakota Blue Richards ... who's both grounded and magical." Peter Bradshaw of The Guardian rated it four stars out of five, praising Nicole Kidman's casting and saying it had "no other challengers as [2007's] big Christmas movie." Leonard Maltin gave the film three out of four stars, and said that "Richards is persuasive" and that it "does a good job of introducing us to an unfamiliar world." Critic Roger Ebert awarded the film four out of four stars and called it "a darker, deeper fantasy epic than the "Rings" trilogy (The Lord of the Rings), The Chronicles of Narnia or the Potter films," saying that it "creates villains that are more complex and poses more intriguing questions. As a visual experience, it is superb. As an escapist fantasy, it is challenging ... I think [it] is a wonderfully good-looking movie, with exciting passages and a captivating heroine." Pullman himself was described by a Times interviewer as sounding "ambivalent" and "guarded" about the film, saying in March 2008: "A lot of things about it were good… Nothing's perfect. Nothing can bring out all that's in the book. There are always compromises". He hoped, however, that the rest of the trilogy would be adapted with the same cast and crew. In July 2009, after this possibility had been exhausted, Weitz told Time.com that he thought the film's special effects ended up being its "most successful element." At the British Humanist Association conference in 2011, Pullman said that there were not, after all, going to be more films with the same cast and crew. While praising the portrayals of his characters by Nicole Kidman and Dakota Blue Richards, Pullman said that he was disappointed with the final film and New Line's re-editing of it. In 2014 Pullman called the film "over-designed" and criticised the screenplay: "They needed an ending that would work for a single film, but one that would also work if it was the first of a trilogy. They wanted both a cliffhanger and a resolution. You just can't do that." Debbie Day of Premiere Magazine, said "The Golden Compass ultimately fails as a film in its broad strokes and inadequate scene development." 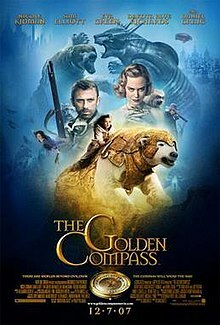 The Golden Compass won the 2008 BAFTA Film Award for Special Visual Effects and an Oscar for Best Visual Effects notably beating what many considered to be the front runner, Michael Bay's Transformers which had swept the VES awards prior. It was also nominated for two Critics' Choice Awards in 2007 ("Best Family Film," and "Best Young Actress" for Dakota Blue Richards), five Satellite Awards and the Hugo Award for Best Dramatic Presentation, Long Form. The Golden Compass was nominated for the National Movie Award for Best Family movie but lost to Disney/Pixar's WALL-E.
At the time of The Golden Compass's theatrical release, Chris Weitz pledged to "protect [the] integrity" of the prospective sequels by being "much less compromising" in the book-to-film adaptation process. New Line Cinema commissioned Hossein Amini to write a screenplay based on the second book in the trilogy, The Subtle Knife, potentially for release in 2010 or 2011, with the third book of the trilogy, The Amber Spyglass, to follow. However, New Line president Toby Emmerich stressed that production of the second and third films was dependent on the financial success of The Golden Compass. When The Golden Compass did not meet expectations at the United States box office, the likelihood of a sequel was downplayed by New Line. According to studio co-head Michael Lynne, "The jury is still very much out on the movie, and while it's performed very strongly overseas we'll look at it early 2008 and see where we're going with a sequel." In February 2008, Weitz told The Daily Yomiuri, a Japanese newspaper, that he still hoped for the sequels' production: "at first it looked like we were down for the count because in the U.S. [the film] underperformed, but then internationally it performed [better] than expectations. So, a lot depends on Japan, frankly… I think if it does well enough here we'll be in good shape for that." Although producer Deborah Forte had, in March 2008, expressed optimism that the sequels would be made, by October 2008, the two planned sequels were officially placed on hold, according to New Line Cinema, because of financial concerns during the global recession. Sam Elliott, however, stated, "The Catholic Church ... lambasted them, and I think it scared New Line off." In 2011, Philip Pullman remarked at the British Humanist Association annual conference that due to the first film's disappointing sales in the United States, there would not be any sequels made. French composer Alexandre Desplat composed the film's music. British singer Kate Bush wrote and performed the song "Lyra" which is played over the end credits. The film's soundtrack album was released on January 22, 2008, by WaterTower Music. All music composed by Alexandre Desplat (except "Lyra", written and performed by Kate Bush). The video game for this film was released in November 2007 in Europe and December 2007 in North America and Australia for the PC, Wii, PlayStation 2, PlayStation 3, PlayStation Portable, Nintendo DS and the Xbox 360. It was developed by Shiny Entertainment and published by Sega. Players take control of the characters Lyra Belacqua and Iorek Byrnison in Lyra's attempt to save her friend Roger from the General Oblation Board. As this game does not fully take into account the changes made by the final version of the film, a small amount of footage from the film's deleted ending can be viewed near the end of the game, and the order in which Lyra travels to Bolvangar and Svalbard follows the book and not the film. ^ a b c d e "The Golden Compass (2007)". Box Office Mojo. Retrieved February 28, 2008. ^ McClintock, Pamela; McNary, Dave (December 6, 2007). "Will 'Compass' find audiences?". Variety. Archived from the original on 2013-12-31. Retrieved August 2, 2014. ^ a b Staff and agencies (February 29, 2008). "New Line merged with Warner Bros Pictures". The Guardian. London. ^ a b Josh Tyler (July 22, 2009). "Comic Con: Chris Weitz Calls Golden Compass A Terrible Experience". Cinema Blend. ^ a b c d e f g Devin Gordon (November 27, 2007). "A Director Confronts Some Dark Material". Newsweek. Retrieved November 28, 2007. ^ a b c d e f g h "Dark Material". Empire. September 29, 2006. pp. 56–7. ^ Erik Davis (October 24, 2007). "Set Visit: 'The Golden Compass'". Cinematical.com. Retrieved November 13, 2007. ^ "Kidman Snubs 'villainous' Pullman Role". Contactmusic.com. November 2, 2007. Retrieved November 13, 2007. ^ "Kidman Confirmed for Compass". IGN. July 17, 2006. Archived from the original on December 28, 2011. Retrieved March 19, 2008. ^ "Philip Pullman answers your questions". BBC. December 10, 2008. Retrieved January 1, 2009. ^ "Kristin Scott Thomas In Golden Compass". Empire. Retrieved November 10, 2007. ^ "The Voice of Iorek: Ian McShane". Bridge to the Stars. July 28, 2006. Retrieved August 3, 2006. ^ a b c d Michael Cieply (August 30, 2007). "Fate of the Cosmos (and of a Studio) Hangs in the Balance". The New York Times. Retrieved October 18, 2007. ^ "Pretender to the Throne". Empire. December 2007. pp. 122–130. ^ Pullman, Philip (August 2005). "The Film". Archived from the original on April 3, 2007. Retrieved March 27, 2007. ^ a b "Movie Preview: The Golden Compass". Entertainment Weekly. August 2007. Retrieved October 11, 2007. ^ "Film London:Old Royal Naval College". Retrieved December 9, 2007. ^ "Production Notes". Retrieved November 15, 2007. ^ "The Golden Compass – Movie Production Notes...CinemaReview.com". www.cinemareview.com. Retrieved 2016-12-12. ^ "Animators on Movie". Bridge to the Stars. October 21, 2006. Retrieved March 29, 2007. ^ "Cinesite to Handle His Dark Materials". His Dark Materials.org. July 27, 2006. Archived from the original on October 11, 2007. Retrieved March 29, 2007. ^ "Where Did 'The Golden Compass' Go Astray? And Was Tom Stoppard's Original Script a Masterpiece?". New York Magazine. December 7, 2007. Retrieved May 4, 2008. ^ "A message from Chris Weitz to His Dark Materials fans". HisDarkMaterials.org. October 9, 2007. Archived from the original on October 11, 2007. Retrieved October 9, 2007. ^ a b McGrath, Charles (December 2, 2007). "Unholy Production With a Fairy-Tale Ending". The New York Times. ^ "A message from Philip Pullman to His Dark Materials fans". HisDarkMaterials.org. October 11, 2007. Archived from the original on October 11, 2007. Retrieved October 11, 2007. ^ a b c "Book Vs. Film: The Golden Compass". The Onion AV Club. December 17, 2007. Retrieved March 1, 2008. ^ a b Lev Grossman (February 28, 2008). "12 Minutes 49 Seconds with Chris Weitz, Director of New Moon". Time. ^ "Reel Lit". Entertainment Weekly. December 21, 2007. Retrieved March 1, 2008. ^ Robert Butler (December 3, 2007). "An Interview with Philip Pullman". Intelligent Life. Archived from the original on March 5, 2008. Retrieved March 5, 2008. ^ a b Lewis Hannam (October 14, 2007). "Philip Pullman film stripped of religious themes". The Daily Telegraph. London. Retrieved October 18, 2007. ^ a b "Chris Weitz Interview". Bridge to the Stars. 2004. Retrieved March 25, 2007. ^ Vanessa Thorpe (October 14, 2007). "Religion row hits Pullman epic". The Observer. London. Retrieved October 18, 2007. ^ a b Hanna Rosin (December 1, 2007). "How Hollywood Saved God". The Atlantic. Retrieved December 1, 2007. ^ "The Golden Compass film review by Peter T. Chattaway, 12/06/07". Christianity Today. Retrieved February 1, 2008. ^ "Film Sells Atheism To Kids; Major Protest Launched". CatholicLeague.org. October 9, 2007. Archived from the original on October 11, 2007. Retrieved October 9, 2007. ^ "Some Catholic Leaders Upset Over New Nicole Kidman Movie". Fox News. October 10, 2007. Retrieved October 11, 2007. ^ Bill Donohue (November 26, 2007). ""GOLDEN COMPASS" SPIN DOCTORS". Catholic League. Archived from the original on November 28, 2007. Retrieved November 28, 2007. ^ Mary McSweeney (October 13, 2007). "Catholic League condemns 'The Golden Compass'". monstersandcritics.com. Archived from the original on October 17, 2007. Retrieved October 18, 2007. ^ "Catholic League: "GOLDEN COMPASS" MISSES THE MARK". catholicleague.org. December 10, 2007. Archived from the original on December 12, 2007. Retrieved December 11, 2007. ^ "Movie Answer Man". Chicago Sun-Times. December 13, 2007. Archived from the original on December 14, 2007. Retrieved January 22, 2008. ^ "The Golden Compass — A Briefing for Concerned Christians". Leadership University. December 4, 2007. Retrieved January 2, 2007. ^ "The Golden Compass: 1 Star — Disturbing". Cinema in Focus (Free Methodist). Archived from the original on January 27, 2008. Retrieved January 2, 2007. ^ Catherine Donaldson-Evans (October 29, 2007). "Christian Groups Claim Pro-Atheist 'Stealth Campaign' in Nicole Kidman Fantasy Film 'The Golden Compass'". Fox News. Retrieved October 30, 2007. ^ a b c David Byers (November 27, 2007). "Philip Pullman: Catholic boycotters are 'nitwits'". The Times. London. Retrieved November 28, 2007. ^ Donna Freitas, God in the dust: What Catholics attacking 'The Golden Compass' are really afraid of, The Boston Globe, November 25, 2007. Retrieved on December 17, 2007. ^ Laura Miller, Religious furor over 'The Golden Compass', Los Angeles Times, December 2, 2007. Retrieved on December 18, 2007. ^ Harry Forbes, John Mulderig (November 2007). "Golden Compass Review (mirrored)". Tomorrows Trust. Archived from the original on 2009-01-11. Retrieved December 23, 2007. ^ "USCCB withdraws review of 'The Golden Compass'". Catholic News Service. December 10, 2007. Archived from the original on December 12, 2007. Retrieved December 14, 2007. ^ "Vatican blasts "Golden Compass" as Godless and hopeless". Reuters. December 19, 2007. Retrieved December 19, 2007. ^ CBS Early Show (November 28, 2007). "Is "Golden Compass" Anti-Catholic?". CBS Early Show. Retrieved November 28, 2007. ^ "Is 'The Golden Compass' Too Anti-Christian, or Not Anti-Christian Enough?". New York Magazine. October 16, 2007. Retrieved October 18, 2007. ^ Chris Kaltenbach (October 24, 2007). "'Golden Compass' draws ire of the Catholic League". Baltimore Sun. ^ Heritage, Stuart (December 15, 2009). "Who killed off The Golden Compass?". London: Guardian. ^ "The Golden Compass on DVD & Blu-ray". DVDTOWN. Archived from the original on January 27, 2008. Retrieved January 26, 2008. ^ "Chris Weitz Interview, Director The Golden Compass". MTV news. Retrieved January 12, 2008. ^ a b "'Golden Compass' Leftovers Pointing To A Potentially Packed Director's Cut". MTV News. Retrieved January 12, 2008. ^ Dean Goodman (December 9, 2007). "'Golden Compass' loses its way at U.S. box office". Reuters. Retrieved December 29, 2007. ^ Dave McNary (January 1, 2008). "Foreign box office hits record levels". Variety. Retrieved January 4, 2008. ^ "'Compass' passes $300M mark at box office". United Press International. January 15, 2008. Archived from the original on January 19, 2008. Retrieved January 29, 2008. ^ Richard Wray (February 29, 2008). "Jobs to go as New Line Cinema merged into Warner Bros". The Guardian. London. ^ Josh Friedman (December 10, 2007). "'Golden Compass' points overseas". Los Angeles Times. Archived from the original on December 18, 2007. Retrieved December 10, 2007. ^ "Golden Compass at Rotten Tomatoes". Rotten Tomatoes. Flixster. Retrieved August 21, 2018. ^ "Golden Compass, The (2007): Reviews". Metacritic. CBS Interactive. Retrieved January 2, 2008. ^ Manohla Dargis (December 7, 2007). "NYT Golden Compass review". New York Times. Retrieved December 28, 2007. ^ James Berardinelli. "Golden Compass review". ReelReviews. Retrieved December 28, 2007. ^ Christopher, James (November 27, 2007). "The Golden Compass review". The Times. London. Retrieved November 28, 2007. ^ Bradshaw, Peter (November 26, 2007). "The Review: The Golden Compass". The Guardian. London. Retrieved November 27, 2007. ^ Ebert, Roger (December 7, 2007). "The Golden Compass :: rogerebert.com :: Reviews". Chicago Sun-Times. ^ Silverman, Rosa (March 22, 2008). "Exclusive interview with Philip Pullman". The Times. London. Retrieved January 1, 2010. ^ Walsh, John (March 15, 2014). "Michael Gove, Catholics, the Taliban - and how Hollywood made a mess of The Golden Compass: The dark side of Philip Pullman". Daily Mail. Retrieved September 3, 2015. ^ "BAFTA Film Awards Winners 2008". British Academy of Film and Television Arts. Archived from the original on March 9, 2012. Retrieved February 26, 2008. ^ "80th Academy Awards nominations". Academy of Motion Picture Arts and Sciences. Archived from the original on January 27, 2008. Retrieved January 23, 2008. ^ "BFCA Nominees 2007". Broadcast Film Critics Association. Archived from the original on December 21, 2007. Retrieved December 28, 2007. ^ McNary, Dave (January 5, 2007). "New Line pulls in pic scribe — Amini to pen second part of Pullman trilogy". Variety. Retrieved July 8, 2007. ^ Peter Sanders (December 19, 2007). "New Line and Director Settle 'Rings' Suit, Look to 'Hobbit'". Wall Street Journal. ^ Tom Baker (2008-02-29). "Does Golden Compass really put religion in the crosshairs". The Daily Yomiuri. ^ Adam Dawtrey (March 7, 2008). "'Compass' spins foreign frenzy". Variety. Retrieved December 1, 2008. ^ unknown (October 20, 2008). "The Golden Compass Sequels On Hold". WENN. ^ Guy Adams (December 28, 2008). "Can fantasy epics survive the Credit Crunch Chronicles?". The Independent. London. Retrieved January 1, 2009. ^ Alistair Foster (December 14, 2009). "Catholics 'forced film chiefs to scrap Dark Materials trilogy'". The London Standard. Archived from the original on February 26, 2011. ^ "Kate Bush pens end credits song: "Lyra"". BridgeToTheStars.net. November 13, 2007. Retrieved November 13, 2007. ^ "Golden Compass game". Sega.com. Retrieved January 2, 2008.